“CITIZENS ADVICE BUREAU” put on the top line of the blank finger-post (no room to fit in a final X) and “END TO END!” on the second line; and then pose with the tandem for our official photos. A bit further along the front Sheila takes another photo of me with the tandem against the backdrop of the sea complete with white water being driven by the wind over the rock of the Longships lighthouse in the distance. I find where the official book recording Lands End to John O’Groats attempts is kept and enter our names. We wheel the bike back through the tourists to the arch at the beginning of the visitor complex and as Sheila says, “Well we had better start pedalling”. With these inspirational words we try out the saddles for comfort and at 2:30 p.m. we set off. The first quarter of a mile and especially the first 100 metres are some of the most nervy of the trip. The gale force wind is broadside on, leading to a slightly crab-like cycling style as we lean into it, and, more worryingly, it is gusting rather than steady so there is a real risk of being suddenly blown over. I say to Sheila that if necessary we will walk on any really badly exposed pieces of the coast rather than start the first day of the trip as a heap of bodies and bike in the road. In fact once we leave this very exposed tip of the peninsula we are protected by walls and hedges to some extent even beside the coast and so cycling becomes more relaxed. In a short distance we leave the A30 and take the B3315 that will lead us in a loop to Newlyn and Penzance. We pedal along a small and twisty road through a series of small places with unmistakably Cornish names: Trevescan, Trevilley, Trengothal, Trebehor, Trethewey and Treen. After Treen we are treated to our first hill that warrants an “arrow” on the map. No problem to us – it is downhill! We then cross the river flowing out to Penberth Cove and are faced with our first bit of serious uphill work of the journey. It is a double arrow climb followed immediately after a hairpin bend by a second single arrow climb. The cycling has become serious and we have only travelled four miles. We shift to the small chainring and take it easy. Although steep, the climbs are really quite short and so we reach the top without too much effort. We pedal on for the most part protected from the wind by the steep banks at the side of the road, and after crossing the Lamorna Valley we turn towards the north. We can now feel the power of the wind on our backs. It is as good as a third pair of legs and with this steady push all the way to Newlyn we make fast time pedalling along at 20mph to 25mph on the flat without effort. At Newlyn we drop down the hill to the coast and cycle around the bay looking at the white breakers driving towards the shore until we turn north again into the centre of Penzance. We arrive in the middle of town and hop off the bike at the traffic lights where we expect to find the CAB office. Not being sure which of the municipal buildings is the correct one we walk along the road and stop a passing policeman for directions. He hasn’t a clue, but a passing local citizen hears our enquiry and she directs us to the correct building. The CAB offices are housed in the former police cells. We make contact with Jacky, the manager, and are welcomed in. Sheila chats to Jacky about CAB matters and then the three of us together with the tandem complete with banner, town name and other publicity material pose for a photo outside the CAB office front door. We struggle a bit with the wind blowing the banner and the town sign about, and we discover later when the photos have been processed that the CAB sign on the front wheel is a bit skewed. Ah well this is our first CAB stop of the trip. By the time we are getting into multiple CAB stops in a few days time we will have this business well practised and polished. We leave the tandem at the bureau and take ourselves for a sight-seeing stroll around Penzance until it is time for Jacky to close up and go home. Our walk also takes in a café for afternoon tea. We might as well begin as we intend to continue! Back at the Bureau Jacky gives us directions to her house at Ludgvan where she is kindly putting us up tonight, and we set off to cycle the three miles with her following later by car. 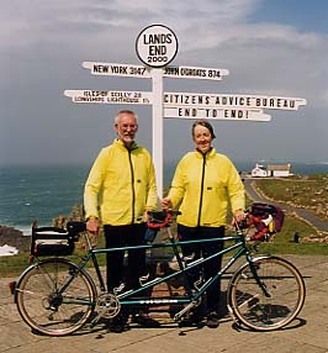 We meet up outside Jacky’s house and manoeuvre the tandem into the dining room where it is to spend the night. It is a good job that it is still nice and clean at this stage of the trip. Jacky’s husband, Clive, is out on a delivery run for the local brewery where he works and is not expected to return until late, so after we have washed and changed we adjourn without him to the White Hart, which is local village pub where Jacky has booked a table. There is an endless discussion of CAB information between Sheila and Jacky over dinner. This continues seamlessly when we return from the pub back to their house. When Clive arrives home there is at last an opportunity to talk about other important subjects such as his brewery and its range of beers. We also talk about wind surfing, which is one of Clive’s passions. He had previously owned and run a wind surfing gear shop in Penzance.